2 Rooms 34 M2 in the center of Paris, renovated. .Métro RER Châtelet Les Halles. Quartier Montorgueil, pedestrian streets and very animated. Apartment very well located and absolutely quiet. Near Metro and bus. Quick access to train stations and airports..Commerces, cafes, restaurants. On foot Pompidou Center, Louvre, Opera, Museums, Le Marais. 2nd floor, 5 people. 2 sofa beds and a new double bed. Kitchen, bathroom with shower, separate WC. New equipment: Fridge, Freezer, Washing machine, Dryer, Dishwasher, Combined microwave oven, TV, DVD player, Hair dryer, Iron and ironing board, Internet WIFI. 640 Euros / week. 1 night minimum rental. Little cozy flat in the heart of Paris very close to most landmarks and tourist attractions. The location was fantastic with loads of cafes, restaurants and delicacy shops just around the corner. Patricia was lovely, very friendly and helpful! The apartment is little but our family of five comfortably stayed there for three nights and everything we needed was there. Would highly recommend this apartment for a stay in Paris. Thank you! had a great time in paris for a short break with my family. the apartment was ideally located within 20 min walk from gar Du norde and minutes from the nearest metro station. however you can easily walk to nearby shopping centre, pompidou centre and the Louvre. 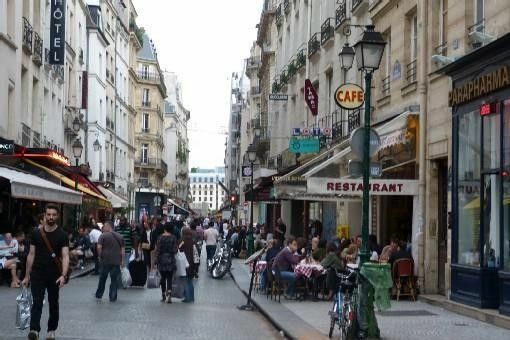 no matter what time of day you left the apartment you are immediately thrown into parisian life, during the day, shoppers and commuters, at night bars and cafes alive with customers. but enter the apartment and you find tranquility in this querky apartment. highly recommended. A perfect spot in a new part of Paris! I have visited Paris many times in the past, but have never stayed in the 2nd arrondisement. Patricia's apartment was perfect--just steps from the bustling and fun Rue Montorguell. Patricia met us when we arrived and showed us around. She had plenty of helpful information about the apartment (e.g., how to operate the clothes washer/dryer) as well as maps and guides of the area. She provided me with the number of a reliable taxi company that we used for our early-morning getaway on the day we left. The apartment is small but plenty large for my husband and me. I loved being able to walk a few steps in the morning to buy bread, pastries, fruit, etc., for breakfast. We had brought our own ground coffee from home and were able to use her electric coffee maker. Very convenient. It was unusually hot when we were there in early October, so we left the windows open. Fortunately the apartment is located away from the street, so noise was not much of an issue. There were two metro stops within a few minutes' walk and many restaurants and shops in "our" little neighborhood. Thank you, Patricia, for helping to make our stay enjoyable. I'm so excited to have "discovered" the 2nd! great host, location, apt- everything! This was my first non-hotel stay anywhere and I feel lucky that it was Patricia's apt that we selected! The location was ideal for my 3 kids under 10 and my husband. We walked to the Louvre (15 min away), got groceries and dessert from the street behind and used Metro/buses from every convenient stop near the apt. Patricia was very responsive, helpful, and a pleasure to communicate with. She even greeted us early in the morning after our train arrival from London. I would def use this apt again on our next paris trip! Patricia is a very sweet person and was there to greet us. The apartment is only half a block off Rue Montorgueil which has tons of cafes, small boutiques, food stands, 2 small grocery stores, etc. Patricia is also going above and beyond for me as I left my iPad there and after contacting her about this she is going to mail it to us. The apartment is cute and has all the necessary items to make your stay enjoyable: WiFi, coffee maker and a fan (it was very hot in Paris). The apartment is near to a grocery store and a street filled with restaurants and bars. It's also walking distance to the Louvre and Notre Dame. The closest metro station is on the line that services two train stations - Gare du Nord and Gare de l'Est. Centre Georges Pompidou, the Louvre, Paris Opera, Montorgueil Market, Forum des Halles, Museum of Arts and Crafts, Picasso Museum, Carnavalet Museum, Le Marais, City Hall of Paris, Rue de Rivoli, Eglise Saint-Eustache, Theatre City, Chatelet Theatre, Grevin Museum.